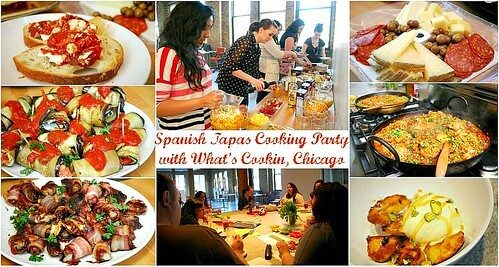 We had a great turn out for our first cooking party in the What's Cookin, Chicago kitchen! What I really enjoyed about teaching the class is that everyone was able to learn and make each of the dishes hands on. It was definitely a collaborative effort and it was great to have everyone in the kitchen at the same time, talking, laughing and just taking in the culinary experience. I can't wait for the upcoming cooking parties we have in store... and if you're in the Chicago area, we'd love to have you join us! I've added an 'Events' tab at the top of this website, which takes you to our event listings within our Facebook page. You'll need to be logged into a Facebook account to get tickets to our events so please have a look to see what's coming up! For our Spanish Tapas Cooking Party, we had a few tapas on the menu with this being one of them. I really liked how easy this dish is put together despite how it may look like much more effort with the beautiful presentation. You can make this dish in advance since it's served cold or at room temperature and the burst of flavors with fresh tomatoes, basil and goat cheese make this a popular favorite! Cut eggplant lengthwise into slices each 1/4 inch thick or thinner; there should be at least 6 inner slices; discard the slices with lots of skin. Sprinkle with salt on both sides; let drain on paper towels. Pat eggplant dry and brush lightly with oil. Cook in large skillet until eggplant is golden on both sides and tender, about 10 minutes. Cool. Spread goat cheese evenly over one side of eggplant slices. Fill with a teaspoon of chopped tomatoes, basil leaf and then roll up, securing with a toothpick. Repeat with all remaining eggplant slices. Combine the crushed tomatoes and basil in a bowl. 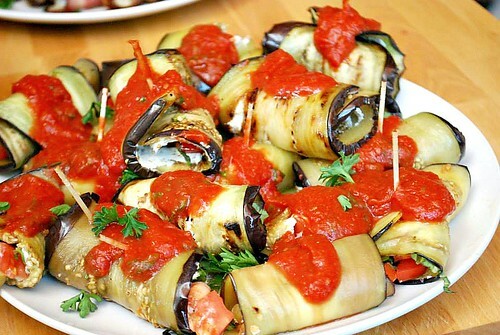 Place eggplant rolls on a serving platter and top with a tablespoon of crushed tomatoes and basil. Serve room temperature or cold. Those sound really good! Thanks for sharing! 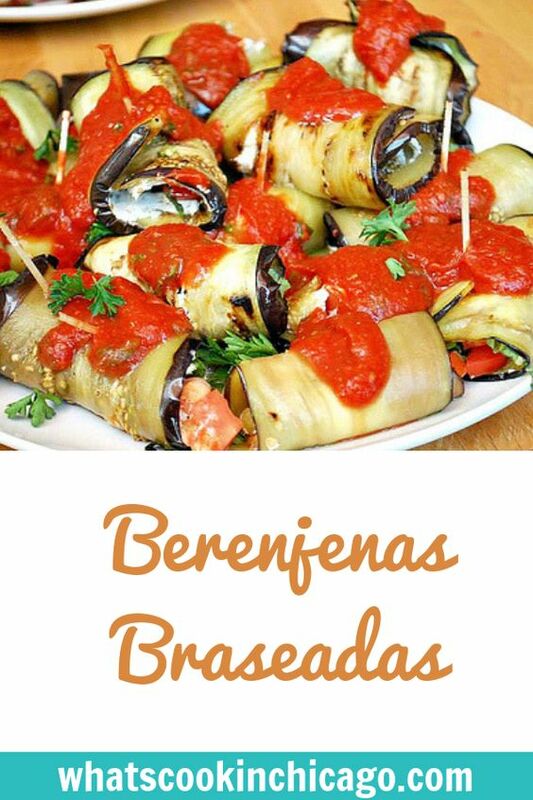 What a great recipe using eggplant. I love it but my family isn't too keen. Maybe if I tried this twist they would begin to like it. Thanks for sharing. YUM. I love that they can be served room temp, or cold. Makes this a good one for potlucks, or parties when you have a lot of hands-on last-minute preps to do. Wish I was in Chicago, I'd just camp at your house waiting for the next event! 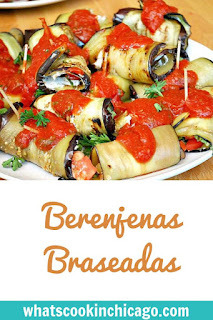 I had never heard of Berenjenas braseadas before. I don't even know if I can pronounce them. But they look amazing! I cannot believe that's eggplant wrap! Wow! I LOVE eggplant and think a wrap like this is quite difficult but great job! I'm bookmarking your blog! I love all the recipes! I would want to have sampled everything. Yum I needed this recipe last summer when my egg plants were a plenty in the garden. Thanks for sharing now I have one to try. Those look so good! I love eggplant, but never really knew how to make it other than just as parm. Those look amazing and delicious! I've never had any kind of tapas before. It sounds like a really great "party"! Oh my foooood! looks delish! Thanks for sharing! Sounds like such a fun event! Glad you had a great turnout. These look easy to make and sound delicious!